Click here to read the Special Report from William Critchley. This report introduces the course and describes some of its history, as well as giving some insight into the proofreading profession. What are the ‘tools of the trade’? Be motivated and be successful! 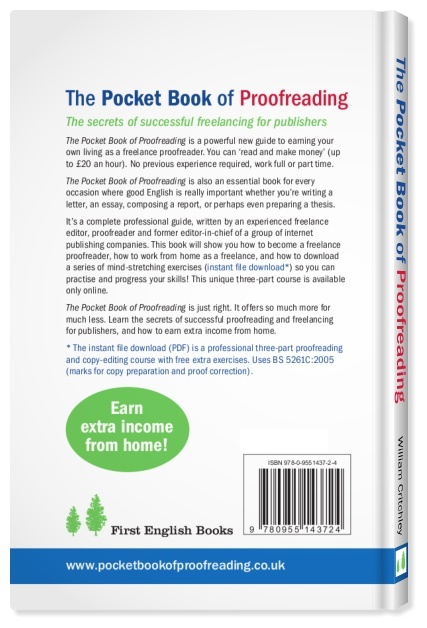 The Pocket Book of Proofreading is a powerful new guide to earning your own living as a freelance proofreader. You can 'read and make money' (around £24 an hour for proofreading and £26+ for copy-editing) after training. No previous experience is required, and you can work full or part time - from home. 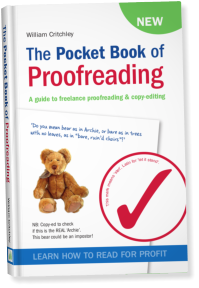 The Pocket Book of Proofreading is also an essential book for those occasions where good English is needed – whether you’re writing a letter, an essay, composing a report, or perhaps even preparing a thesis. It’s a complete professional guide, written by an experienced freelance editor, proofreader and former editor-in-chief of a group of Internet publishing companies. You can download Learn Freelancing's new Proofreading and Editing Course from this website – a series of exercises (instant file download), including free exercises, notes with all the answers/corrections explained and a Scorecard so you can accurately measure your proofreading skills. NB: Learn about copy-editing too with comprehensive practical exercises. Many people have been successful with The Pocket Book of Proofreading and the unique downloadable course – see the testimonials page. Note: You'll find instances of double (") and single quotes (') on this website. For the sake of consistency, choose one or the other in your proofreading and copy-editing. See The Pocket Book of Proofreading for more details. Thank you to all those buying the book. 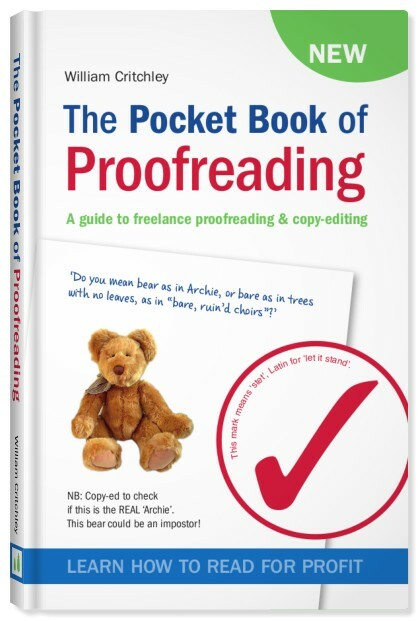 New: The Pocket Book of Proofreading is available as a Kindle edition from Amazon.co.uk. Split infinitives? It's now normal 'to brazenly break the rules'. Analysis of 11.5 milion words of British conversations finds that the use of split infinitives ('to boldly go' instead of 'boldly to go' or 'to go boldly' - putting an adverb between 'to' and the verb) has quadrupled over tne past 20 years. The research by Cambridge University Press and Lancaster University noted a growing tendency to start sentences with 'like' ;-) (The Times, 25 Sept 2017). Thank you for latest review 37 from PS Ste...el. It's always so much appreciated to get feedback from readers of the proofreading book! Being a competent proofreader or copy-editor means being able to spot small nuances. Have you ever thought about the difference between marinate and marinade? Note: All Learn Freelancing courses (quite separate from the proofreading book) now include a free practical example explaining on-screen editing. It shows you how this editing skill is used with a job of just over 4 hours earning £93. A fair amount of work is now done onscreen using Word's 'Track Changes'. Funny thing is, proofreading symbols as such are not used! But once you get the hang of it, it's easy to edit onscreen, and quite satisfying too. ALSO: If buying or downloading the Learn Freelancing Proofreading and Copy-editing Course from the 'How to Order' page, after reading The Pocket Book of Proofreading, please note that you will also receive a 'Welcome email' with two Word attachments with more details about how to get started. However, these are not downloaded automatically but follow from me usually within the hour or at most a few hours. Ever get stuck pronouncing words? 'Emma Saying' has covered most. For example, in Britain, should we say 'skedule' or 'schedule'? Well, 'skedule' is American English, and 'schedule' (shed-ule) is how you should say it here - but lots of people get it wrong. How we live now (NOT! ): Displaying your books backwards for 'neutral' effect and avoid colour clashes! HELP with words. Is it scone to rhyme with con or scone to rhyme with cone? Of course they don't rhyme with stones! Q: Do you still get 'typescripts' to work by mail on or is just about everything done onscreen with track changes? A: It depends on whether it's a copy-edit or proofread. All copy-edits come to me in Word and I do the edits onscreen with track changes. Proofreads vary - quite a few still come in the post as hard copies, but I also get PDFs too (no Word files for proofreads, at least from publishers). Non-publishers tend to send me PDFs, sometimes Word files - but not hard copy. Q: Do you ever have to correct PDFs or is it still Word mainly? A: As above - always seems to be Word if it's a copy-edit, but PDFs for proofreads. Q: If you had to correct or add changes to a PDF are there any free versions or do you still need a 'professional' one? NEW: A query: 'What's the best software to use if you have graduated from working with paper proofs to working onscreen?' Thanks to Liz for the answer. I usually use Word for copy-editing and Acrobat for proofreading, though I also sometimes proofread in Word - generally only for non-publisher clients though. To be honest though, most publishers still send me paper proofs! Thanks also to US readers, and further afield in Canada and Europe, for your interest in The Pocket Book of Proofreading. Copy-editors are not supposed to input their own opinions but this is what I did once when asked to copy-edit a book based on the Russian 'liberation' of Czechoslovakia [now the Czech Republic], co-written by two Russian generals. That is to say, in a nutshell, that Russian tanks went into Prague to 'liberate' the country from the control of traitor Alexander Dubcek, the reformist leader who initiated the reforms of the 'Prague Spring'. I could not allow this to go unchallenged, so re-wrote much of the book, having found out in reference libraries what really happened, as in the West we still have free a press and free access to facts. I sent in my invoice, which from memory was about £450. Shortly after the book was published, I was called in to the commissioning editor's office to explain my actions. The two generals were furious (as in purple with rage), alleging Western propaganda had found its way into the book. They demanded all copies be destroyed, and asked for a new copy-editor! I kept my freelance role with the publishers, however. Subsequent historical facts as they emerged proved me right, and the generals disappeared from history, along with the Berlin Wall. PS: If you sent in an invoice to the Kremlin, would you get paid? What makes a bestseller? I've always been interested in what sells to readers. Amazon has a very useful tool that tells you, by the hour, of a book's sales ranking. If you are listed at 14,000 in Books, it means that 13,999 books sell more than yours. I happened to see that former FBI sacked chief James Comey is to publish a new book on the 19th April. It has already hit no. 1! To be published by Macmillan, 304pp., on April 19th, A Higher Loyalty: Truth, Lies, and Leadership. WHAT DOES 'EASTER' REALLY MEAN? Eggs, rabbits, the 'Paschal lamb'? Report from The Times (Monday 25 July): 'Latin abbreviations are to be barred from government websites because they may confuse people whose first language is not English.' Eventually, all Latin abbreviations will be edited out. Facing the purge are e.g., exempli gratia (for example), i.e. (id est, that is) and etc, an abbreviation of et cetera (and other things). On such sites, e.g. will be replaced by words such as 'like', 'such as' or 'including'. One drive, two drives; one patio, two patios - once again, the fatal attraction to sticking apostrophes in the wrong place! Thought for the day: Every editor, copy-editor or proofreader has to scan words carefully, sometimes to ensure material is not libellous, and always has to be sure the words used make good sense. One small example, passing Li's Chinese takeaway today. A large sign read, 'NO ADDED MSG'. This has a quiet irony, as it might mean no added MSG - apart from the MSG already in it! Is it better to say, 'NO MSG ADDED'? Have you ever wondered what happened to Saudi journalist Jamal Khashoggi? It looks like there will be some major news this Tuesday 23rd October. On this day in 1958, October 23rd: Boris Pasternak, author of Dr Zhivago, was awarded the Nobel Prize for literature. He declined to accept it because of pressure from the Russian authorities. A case of Russian (daylight) robbery. 'Capitalised words should not be used when setting assignments because it can worry students, university lecturers have been told...any lack of clarity can generate anxiety and even discourage students from attempting the assessment at all.' Capitalising a word could emphasise a task's 'difficulty or high-stakes nature'. And in the age of oversensitivity: Library poster advertising a production of 'Snow White and Her Little Friends'. and does a better job than two experienced editors! passed as good to go to print! As well as these 'howlers', Sarah found many missed punctuation errors, full stops, brackets, and omitted quote marks. Thank you Sarah, a superb effort! A classic proofreading mistake in a Draft Green Belt Review. Note: have heard of flood plains before but never a 'food plain'.